Why is there so much EVIL in the USA? Years ago, A PENTAGRAM OF BLOOD was drawn upon a map of North America. 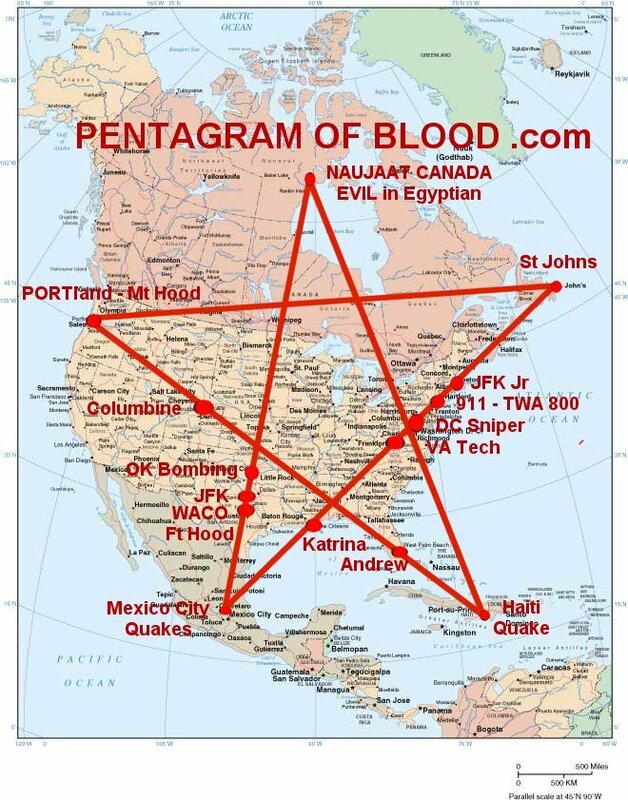 The FIVE LINES OF THE BLOOD PENTAGRAM run through EVERY MAJOR CITY in the USA! Every recent HEADLINE tragedy in the USA, is on one of these 5 LINES OF BLOOD! BLACK MAGIC IS VERY REAL! Here is PROOF, that events like the assassinations of JFK-RFK-MLK, the Oklahoma City Bombing, 911, Katrina, Andrew, Columbine, VA Tech Massacre and WACO are all connected to THE BLOOD PENTAGRAM that has CURSED the USA! First, for most of the past 30 years an initiate of BLACK MAGIC has either been President or vice-President of the USA! That is THE BUSH family. George W. Bush is a third generation SKULL and BONESMAN! A BLACK MAGIC CULT run out of Yale! 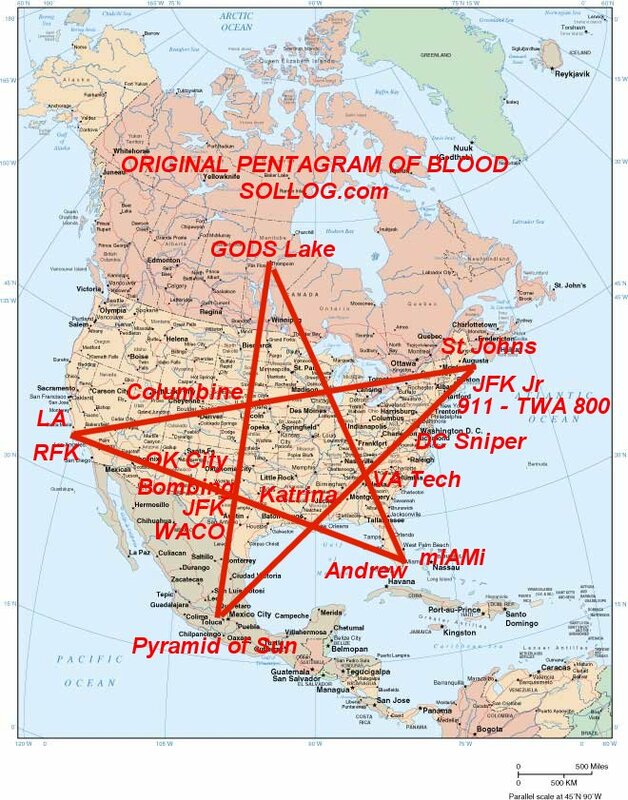 CREATE THE BLOOD PENTAGRAM yourself on a map of North America. See for yourself how EVERY MAJOR CITY in the USA is on one of the 5 LINES OF BLOOD! Notice how virtually EVERY MAJOR EVIL EVENT for DECADES has struck on these 5 lines in the USA! The HEAD POINT OF THE BLOOD PENTAGRAM starts in Northern Central Canada, near GODS LAKE! BLACK MAGICIANS MOCK GOD! So do the POINTS of this BLOOD PENTAGRAM! Draw a line on a map of North America from GODS LAKE in Canada to THE CITY OF I AM, aka mIAMi in Florida. Hurricane Andrew struck at the POINT of this Line south of Miami! Then draw a line to the City of Angels, aka Los Angeles California. Wild fires, mudslides and Great Quakes plague the area of this POINT of THE BLOOD PENTAGRAM! The RFK assassination struck near this POINT! Now draw a line from the City of Angels to ST JOHN in New Brunswick Canada, Northeast of Boston. So many recent BLOOD SACRIFICES have STAINED this LINE OF THE BLOOD PENTAGRAM. The line runs through the Denver area. A recent Church shooting and the COLUMBINE MASSACRE is near Denver. The line runs through OMAHA the recent mall shootings. Chicago and Detroit are on this LINE of BLOOD in THE PENTAGRAM OF BLOOD! Soon a plague from CRYPTOSPORIDIUM strikes these cities! The fourth line is PURE EVIL! Connect ST JOHN to THE PYRAMID OF SUN, the ALTAR OF HUMAN SACRIFICE just north of MEXICO CITY! This LINE OF BLOOD runs through Boston - New York City (911) - Philadelphia (worst murder rate in the USA) - DC (the capitol of EVIL) - Blacksburg VA (VA Tech Massacre) - Atlanta - Montgomery (MLK assassination) - New Orleans (the city of voodoo struck by KATRINA). THOUSANDS have died in "sacrifices" on this line of BLOOD. 911 and Katrina took most of the lives! The Altar of HUMAN SACRIFICE is at the POINT of the BLOOD PENTAGRAM near MEXICO CITY. The ancient Pyramid of the Sun! A great quake took thousands of lives in Mexico City not long ago! Connect Mexico City to GODS LAKE in Central Northern Canada. THE BLOOD PENTAGRAM IS COMPLETE! This 5th LINE goes through WACO Texas, the SIN of Clinton! Through Dallas, the assassination of JFK! Oklahoma City, the bombing. Corpus Christi is on this line, the DEATH of Selena. The city soon leveled by a Historic Hurricane! GREAT QUAKES strike Los Angeles and Phoenix soon on the LA to Miami Line! Miami is struck by a Historic Hurricane. Detroit and Chicago have outbreaks of Cryptosporidium a water virus that is dormant for now in the water of the Great Lakes. Great Quakes strike the Appalacians. Philadelphia and New York City are leveled by THE GREAT EAST COAST QUAKE! What is the fate of Washington DC? In 1947, the leaders of the USA received a WARNING and ORDER! It was, STOP ALL NUKES NOW or be DESTROYED! The world will watch as the GREAT CITIES OF EVIL, which is THE USA, are laid to waste by Earthquakes, Hurricanes and Plagues! There is a "Creator". I have released two SCIENTIFIC PROOFS since 1995, that PROVE this Solar System was DESIGNED! The "Holy Books" of mankind are all LIES! The Books created by Jews after The Torah are LIES! So are the New Testament and Qur'an! These "Holy Cities" shall be leveled by HISTORIC GREAT QUAKES to prove the "god" of the Jews, Christians and Muslims is a LIE! DESTROYED by Great Quakes are Rome Italy, Jerusalem and Mecca, the so-called "Holy Cities" of Mankind! MANKIND, in 1947 your "leaders" were ORDERED to STOP ALL NUKES! Now, city after city is LEVELED by historic Quakes, Hurricanes and Plagues! I AM THE LORD OF LORDS! The original Pentagram of Blood is the Minor Pentagram first revealed in 2007 by Sollog in this Prophecy. By 2008 the Major Pentagram of Blood was redefined to show the true HEAD of the Pentagram in Naujaat and not Gods Lake. The map creator had two choices to make, to use either Kingston or Port Au Prince as one of the points. Sollog told the creator of the map from Prison the PENTAGRAM OF BLOOD MAJOR would be clear when a great disaster struck either Kingston or Port Au Prince. Since this prophecy was released, Barack Obama has ascended to power. Sollog released his BARACK IS SATAN Prophecy before Barack was elected. 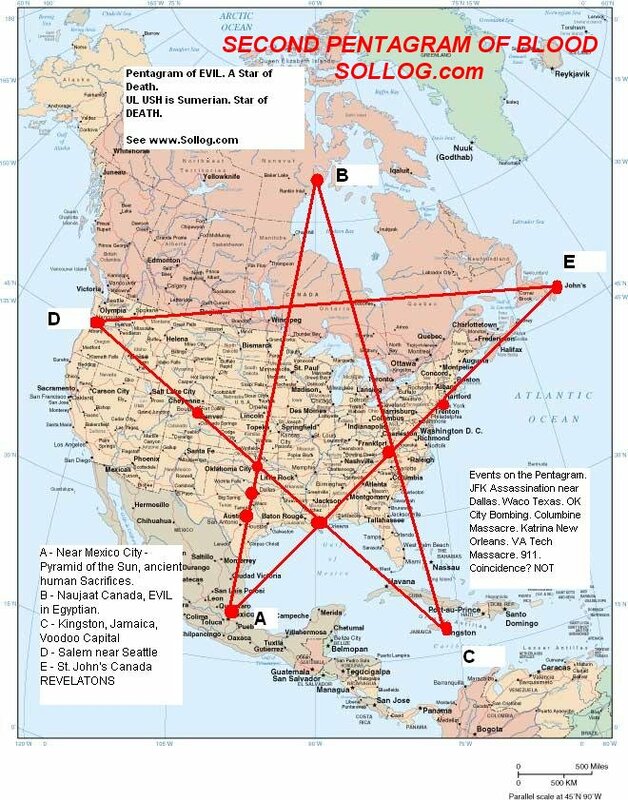 The final map shows many historic events connected to this EVIL BLACK MAGIC PENTAGRAM. For skeptics that doubt Sollog's Prophecies, this link proves Sollog revealed this Pentagram way way in 2007.